Carolyn Jean Brooks-Fields was born on July 15, 1949 in Newark, New Jersey to the late Calvin C. Brooks Sr. and Minnie Lassiter Brooks. Carolyn attended the Newark Public School system graduating from West Side High School. Right after high school she attended business school. Carolyn had many careers during her lifespan. She worked at Reilly’s Restaurant, Electro Plastics Inc., PFI Pharmaceutical Company, and the Department of Veterans Affairs where she retired two years ago. She retired as a medical supply technician. She was considered the mother of the department and was loved by all throughout the VA hospital. Carolyn joined Mount Olive Baptist Church under the leadership of Reverend Russell Fox Sr. She was a faithful and active member under his leadership as well as under Reverend Michael J. Jordan until her untimely death. As everyone should know she had a love for three things. She loved to usher in the church, her grandchildren whom she gave the world, and last but not least going to the various dollar stores every weekend. Carolyn was tough, fearless, strong, brave and outspoken with a sense of humor. She never had an issue expressing exactly what was on her mind. Her way of expressing herself was straight to the point with no chaser. She was a caring and giving individual. She would help others by any means necessary. She took care of and looked after those she loved. She was the matriarch of the Brooks family. No matter how many challenges, obstacles or restrictions she experienced, she never allowed it to hinder her. She always seemed to push through. She will be greatly missed by all. Carolyn was preceded in death by her late husband Raymond Fields, stepson Keion Williams, her brothers Calvin Brooks, Arthur Brooks, Ronald Brooks, her sister Deborah Brooks, sister-in-law Laverne Brooks and brother-in-law Samuel Furr. Carolyn departed this life on March 27, 2019 in Livingston, NJ at Saint Barnabas Medical Center. Carolyn leaves to cherish her loving memories: her two daughters, Reshandor Fields and Jeannine Fields; two grandchildren, Alex Blocker Jr. and Azariah Fields Shaw; two sisters, Marilyn Furr and Lenora Brooks Shipman; two brothers, Garry Brooks and Mark Brooks; two sisters-in-law, Frances Brooks and Twanda Brooks; one brother-in-law, Maurice Shipman; and a host of nieces, nephews, other relatives, friends, and her church family. 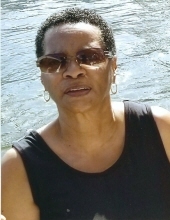 This Online Memorial has been created to commemorate the life of Carolyn Jean Brooks-Fields. Leave a message on the Tribute Wall to share your favorite memories and offer words of sympathy and comfort. To send flowers or a remembrance gift to the family of Carolyn Jean Brooks-Fields, please visit our Tribute Store. "Email Address" would like to share the life celebration of Carolyn Jean Brooks-Fields. Click on the "link" to go to share a favorite memory or leave a condolence message for the family.